Anyway, there’s a new Dynamic Duos challenge today! It’s a black tie event, quite fancy. 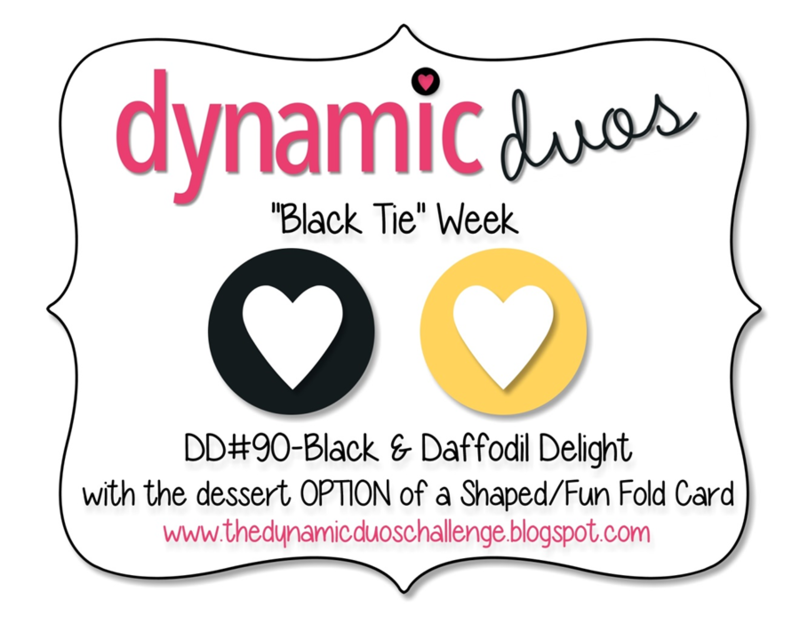 The colors are Basic Black and Daffodil Delight, with the dessert OPTION of a shaped/fun fold card. I decided to go with a center step card, since I’ve never made one and have been meaning to try it. I used a diagram from here to make the card. My base is Basic Black, obviously. The strips on the sides are from the super-fun Kaleidoscope designer series paper. For the big flowers, I used the Flower Shop stamps with the matching Pansy punch for the base. 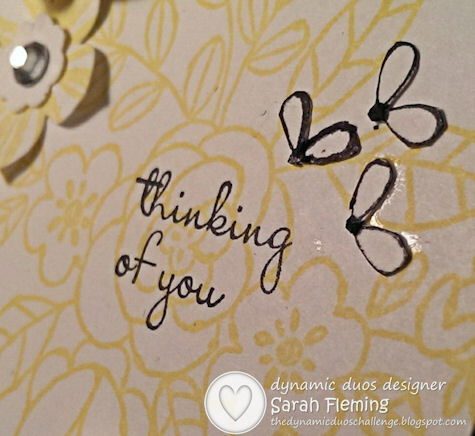 The middle flowers are punched out of Daffodil cardstock using the new Petite Petals punch, and the smallest flowers are punched out with the flower shape from the Itty Bitty Shapes punch pack. The centers of the three center flowers are black Candy Dots (from the Neutrals Candy Dots), and the centers of the other flowers are Rhinestone Basic Jewels. Two of the three flowers in the upper left of the center panel are Flower Shop stamps, and then I just punched out the center of the flowers with the Petite Petals punch. The sentiment panel is Whisper White cardstock, and I stamped one of the images from the So Very Grateful stamp set in the center in Daffodil Delight. Then I stamped the sentiment from the Sweetly Framed hostess stamps over the flowers in StazOn. My favorite part of the card, my oh-I’m-a-genius-not-really-but-I-feel-really-smart moment, is the little trio of bees or flies or whatever. 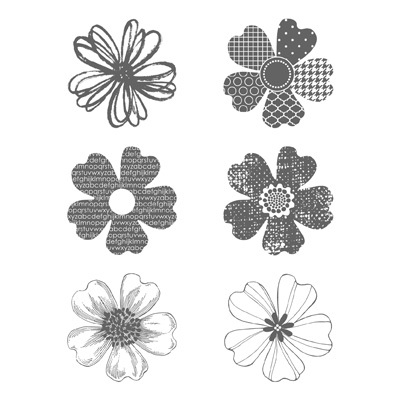 There’s a little four-petal flower strip in the Sale-A-Bration set You’re Lovely. I stamped that strip (there are 5 flowers or random 4-petal shapes in each strip) in StazOn, then snipped out two petals and the center dot for each little bee using my Paper Snips. Hee! I hope you like the card. You can find all the supplies I used in my online Stampin’ Up! store (the You’re Lovely set can only be earned by purchasing $50 through 3/31). 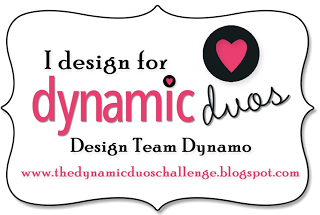 Head on over to Dynamic Duos and join in the fun, and see the beautiful creations the other designers made! Have a great day! Such a great fold/shaped card!! I may have to try this soon as yours turned out beautifully!! Love your center step card and your pretty layered flowers. Great design and a great card. Sarah, this is so so pretty! Love how you put the flowers around the front and I love your focal point with the touch of black. Very pretty! 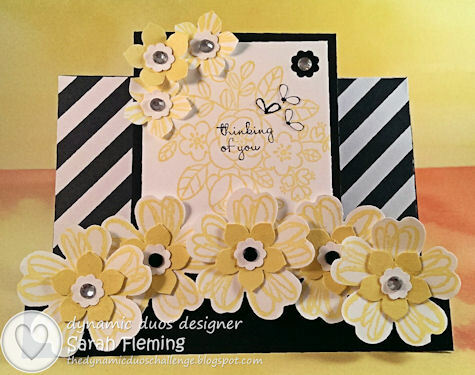 Love your step card and all of the flowers (plus the little “bees”) – so pretty! Love these pretty flowers…makes me long for sunny days! Sarah, you ARE a genius, those little black flies are über-cute! Way to stretch your supplies. Your card is just exploding with sunny blossoms and promises of spring. And it kills me that you love curling! Such a Canadian thing! We’ll be watching the curling finals, too. Wow–what a beauty! Love those gorgeous flowers!